This is a fragment of an unfinished piece (one of many) on UFOs, and the focus is on how Kenneth Arnold's 1947 report of flying saucers became the inspiration for industry, from advertising stunts to motion pictures. 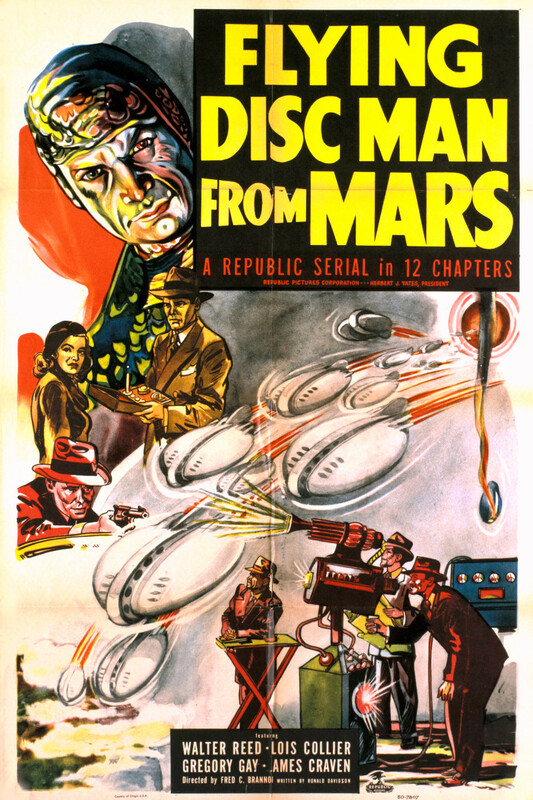 The first to benefit from flying saucers was newspapers and radio networks, and they built the interest up in the public, and then capitalized on satisfying the demand by keeping saucer stories in the news. 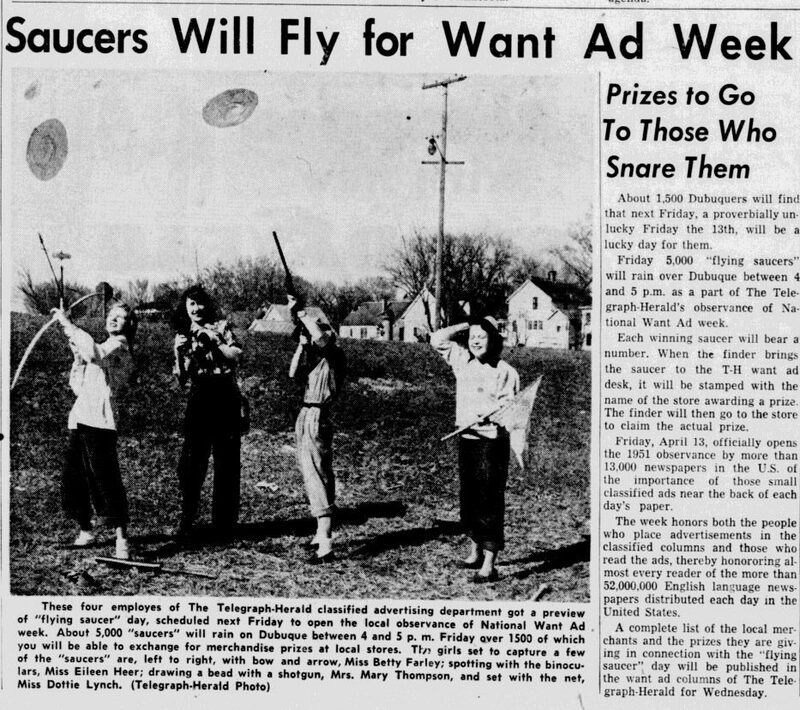 Other businesses wanted a piece of the action and soon there were flying saucer-themed hamburgers, sundaes, cocktails hats, and more. 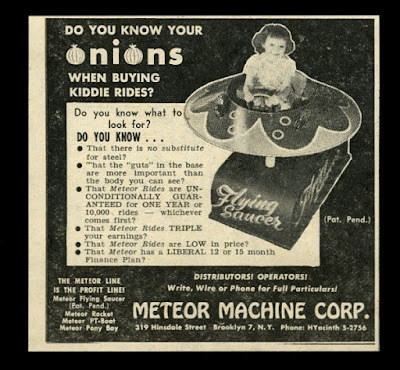 See UFOPOP's UFO/Flying Saucer Merchandising Gallery. One of the first commercial stunts was for radio stations to have planes drop paper or foil disks with slogans advertising their station. This started as early as July of 1947, and the photo seen below is from 1951. The Telegraph-Herald, Dubuque, Iowa, Sunday, April 08, 1951, page 17. The fastest way to cash in was to rename an old or recycle existing products, such as Republic did in 1950, taking leftovers from The Purple Monster Strikes to make Flying Disc Man from Mars. 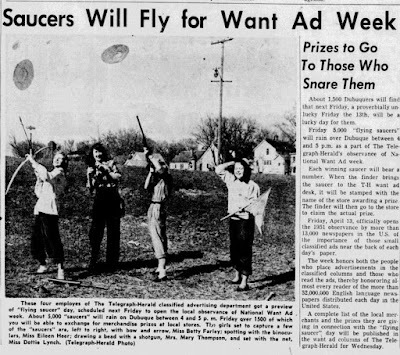 It took longer to get original products manufactured, but in time those appeared with and there were flying saucer kites, toys, arcade games and amusement park rides. Billboard magazine announced a debut: November 20, 1948. "The Flying Disc is a brand new ride being put out by Bisch-Rocco... a spinning ride and will carry 32 passengers at one time.” They later renamed it the Flying Saucer. There were also coin operated rides for kids that were placed in the front of stores. "I took a trip to the shopping mall. I watched one of those machines that you plug a quarter into and this thing goes around and around. It's a flying-saucer ride made for kids. And I thought, Suppose the kid disappeared. Just disappeared in front of his mother and the people walking around. What would that be like? Now, that interested me very much." Magistrale, Tony. 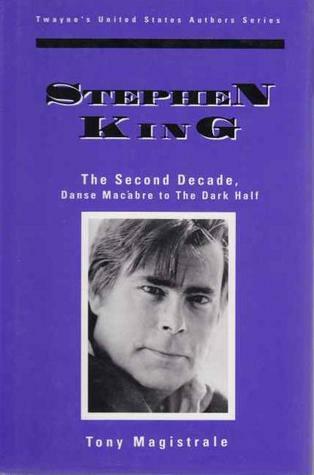 Stephen King, The Second Decade. 1992. The first and most famous non-fiction book on UFOs by Donald Keyhoe was a paperback best-seller titled, The Flying Saucers Are Real. 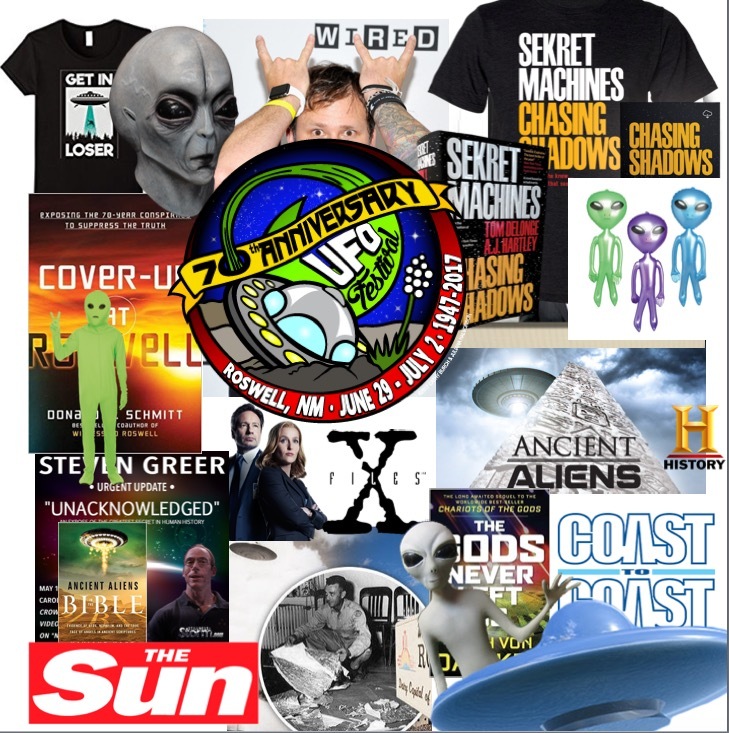 Keyhoe was able to persuade a good many people of that possibility, and gave the topic a big boost incredibility, helping keep it alive into the 1960s when mainstream media discussed the investigation of UFOs seriously. Since then, the scientific side of things has withered, while the fictional and entertainment merchandising of UFOs has thrived, continuing to do big business.